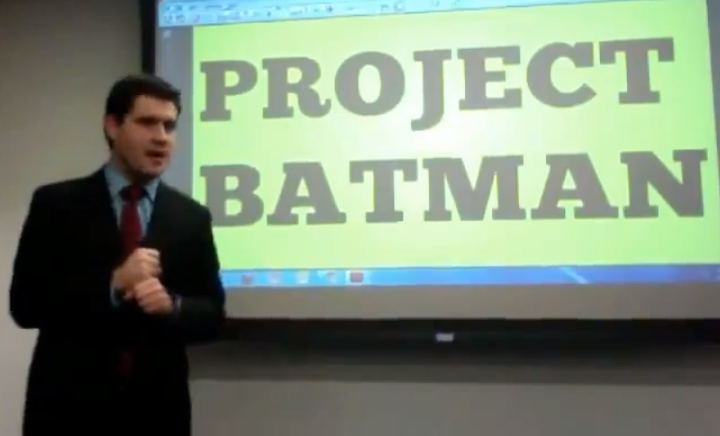 City of Chicago Director of Analytics Tom Schenk Jr.
YEAH, CHICAGO HAS A &apos;PROJECT BATMAN.&apos; Chicago&apos;s analytics director, Tom Schenk Jr. — who kinda looks like Bruce Wayne, doesn&apos;t he? — tells a gathering of journalists, programmers and government leaders the city&apos;s working with the University of Illinois at Chicago to visualize crime data in a 3-D virtual reality "cave." &apos;THE NRA WANTS TO KEEP GUN RECORDS SECRET FROM EVERYONE EXCEPT THE NRA.&apos; You know those public gun ownership records that have brought shame and death threats to journalists who&apos;ve dared even just to express interest in them? The records the National Rifle Association contends shouldn&apos;t be public because they put gun owners "at risk to criminals who may target their home to steal firearms"? Funny thing: Gun-rights groups, including the NRA, have for years been diving into those records for fundraising and recruiting efforts, according to Gawker. * For NYC&apos;s Bloomberg, election that nominated Robin Kelly for Congress was mainly about testing political strategy to defang the NRA. * ... And for Republicans in that race? Guy who did almost 20 years for burglaries, armed robberies and aggravated battery. * Chicago Magazine&apos;s Carol Felsenthal: "Bloomberg could be a key funder of a Rahm run for the presidency." * "Gun rights" Democrats may pay a price for coziness with NRA. * Downstate Republican Illinois representative compares gun control to emasculation: "You folks in Chicago want me to get castrated because your families are having too many kids." Friday: The next WBEZ Meyerson News Quiz. Take last week&apos;s now. SHOULD NPR SWEAR OFF GOVERNMENT CASH? National Public Radio&apos;s former CEO says walking away from federal cash would lay to rest questions about the organization&apos;s credibility. He says public radio "would do better" without public financing. * Countdown to sequestration just latest of many. RESISTANCE IS FUTILE. What some fans consider the best two "Star Trek" episodes ever -- "The Best of Both Worlds" (a.ka. Capt. Picard goes Borg) -- will be shown, newly remastered for Blu-ray, as a single movie on the big screen, one night only, April 25. * 22 Illinois theaters on list of those screening the episodes. * The departing Pope Benedict&apos;s future living arrangements are raising eyebrows around the world. * Nonprofit foundation seeking couple for 501-day roundtrip mission to Mars.